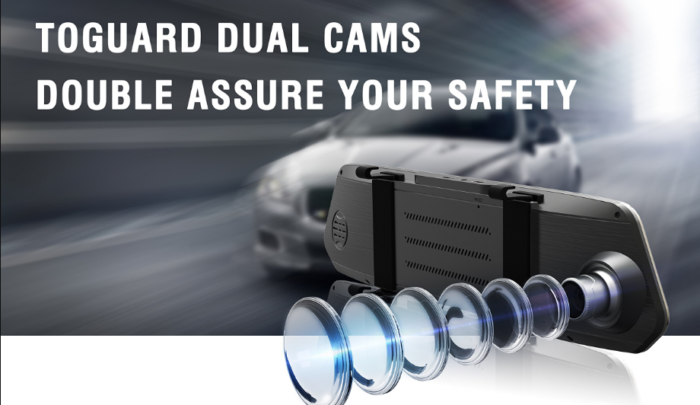 Manufacturers of Digital Portable video and audio recorders, especially Dash cameras, as well as hunting cameras, offer OEM and ODM services by Toguard Electronics Co. Limited Chinese professional manufacturer. TOGUARD is an industry leader in Home and Personal Security Monitoring Technology. 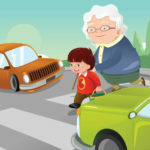 Do you need to maintain the safety and your car, record moments while driving, or keep an eye on the car when you leave the car, this company is here to help. 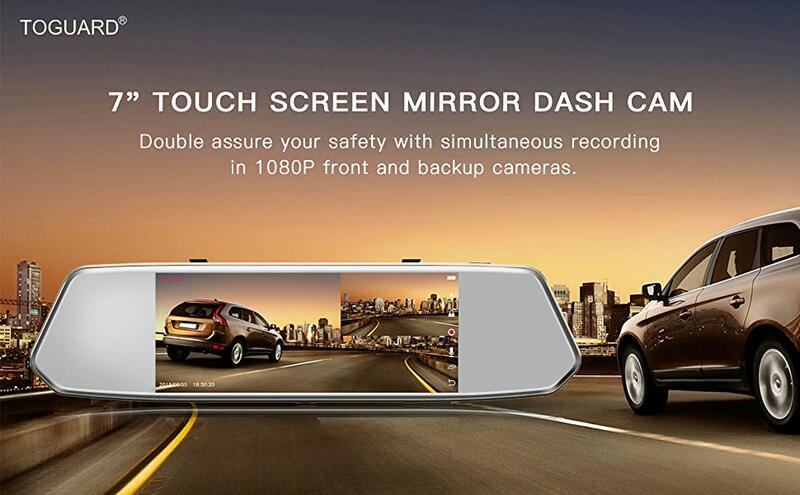 Maybe you’ve heard of the Toguard Backup Camera 7 product Mirror Dash Cam 1080P Front Touch Screen. Dual Lens Rear View Mirror with Waterproof Reversing Camera, this is one of the dash cam products from these brand. Reverse Camera Kit for Secure Parking. Toguard 7 car smart mirror. 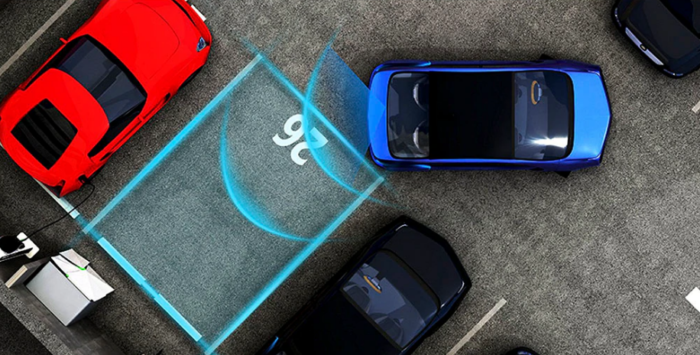 Connect the red cable from the rear camera to the backlight, the rear camera image will automatically switch to full view and trigger the guideline for secure parking when gear R is activated. Parking Monitor & G-Sensor. Toguard 7 car smart mirror. Triggered by the Parking Monitor (someone crashes into your car), the mirror dashcam will automatically turn on itself and record when the vehicle is parked. Sensor-G will automatically lock the recorded video for safekeeping when it detects a collision. 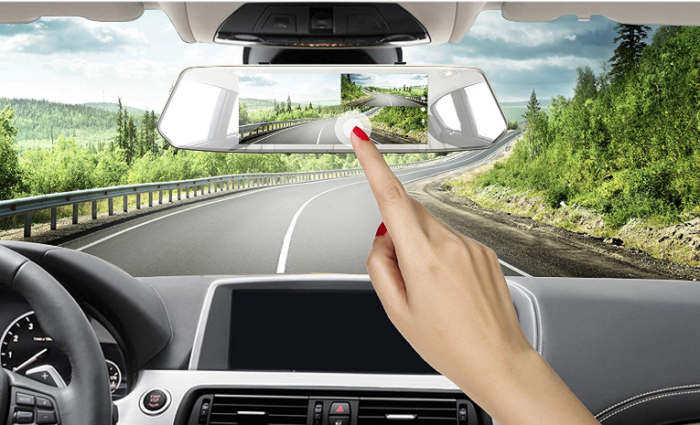 Equipped with these advanced functions, the 7-inch mirror dashcam provides strong evidence of disputes if you have an accident and give you peace of mind when driving. IPS 7 Inch Touch Screen & Unique Features. Toguard 7-inch car smart mirror wifi. Compared to other rearview mirror cameras, the resolution of the dashcam screen is amazing when you play video files, giving you a special visual party. The IPS screen provides a wide visual angle that makes it clearer to view videos laterally. User-friendly and unique User Interface Our easy-to-use design and menu set. The display and edges of the screen are very beautiful, so the mirrored dash cam will better fit your car after it is installed. Photo Resolution: 12M / 10M / 8M / 5M / 3M / 2M / 1.3M / VGA. Circle Recording: Off / 2 min / 3 min / 5 min. Screen saver: Off / 30 seconds / 60 seconds. Parking monitor: The camera will turn on automatically and record it then turn off automatically when the camera detects shock. Date / Time Stamp: Support. Record audio video: ON / OFF. Adapter, USB Car Charger, Built-in Battery. Languages: English, French, Spanish, German, Italian, Japanese, Portuguese, Russian. 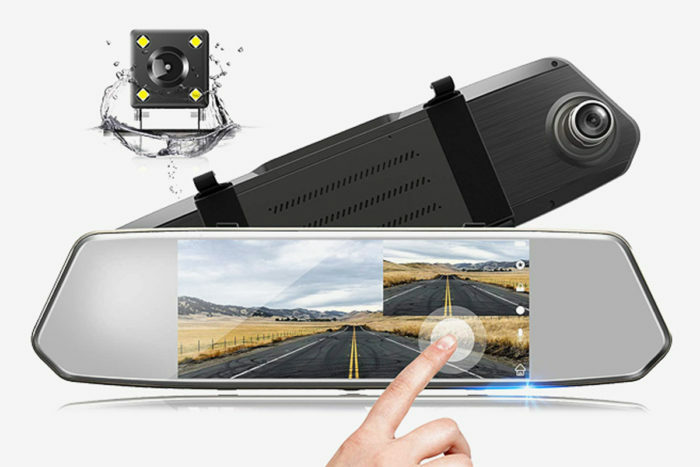 Simultaneous recording in 1080P Full HD & 170 ° wide-angle lens waterproof video recording front view and 480P & 120 ° rear dash cam, the best companion in your driving trip, safeguarding your safety and your car. The front mirror dash cam still works even though it doesn’t connect the rear camera. The 7 “touch screen is quite responsive, beautiful and big. The screen for setting, video recording, photo taking, and playback are in the mirror itself which is sensitive to touch. The interface is easy to navigate and manages multi-function menus. Well-Designed and Simple Interface IPS and a superb screen edge design wider & clearer and smoother with your car than most traditional mirror dash cameras, enjoy recording and real-time monitors while driving; The interface is easy to navigate and manages multi-function menus. The rear view of the cam switches to full HD image reversing the screen including backward with the help of the line when the vehicle is reversed, no need to turn around and easily park with the help of guidelines. With loop recording, the latest recording will automatically overwrite the oldest when the micro SD card is full, never miss any moments. 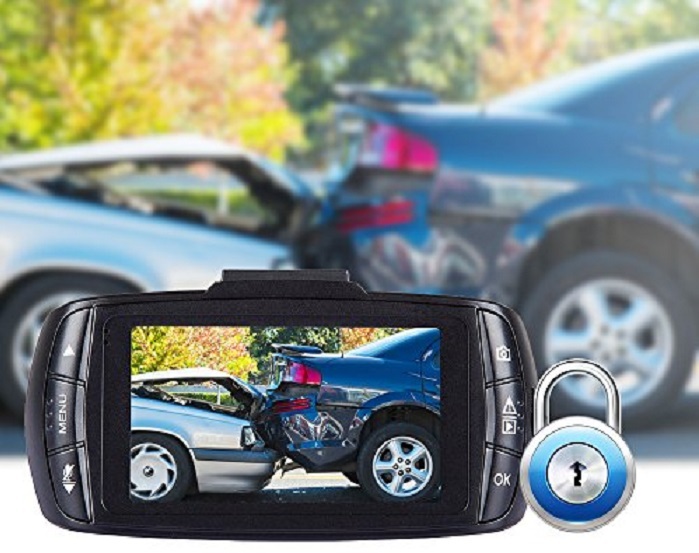 G-sensor will automatically lock the video recorded when a collision is detected in the event of an accident, everything is there for your insurance company. With an internal battery, the dash cam will turn on automatically and record 30 seconds after detecting shock or vibration when parking and turning off the engine. This works when turning on a car engine, recording 10 seconds after detecting motion, which can save micro SD card space. This review comes from several people who have used this dash cam, which is packaged in one review. It has the widest screen ever seen for the dashboard and one of the main reasons to bought this one. It records front and back. This records based on movement activation when parked. 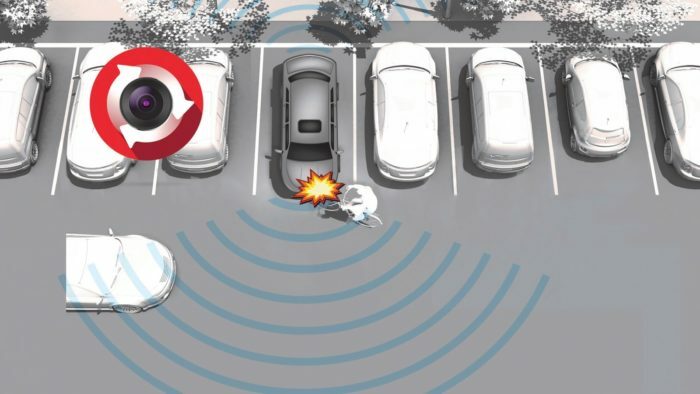 Has a G sensor if your car is hit. You can keep the display active or off. Many wires to run and install. Super quality for front video. The device can only handle 32 GB memory cards. Memory card size is the biggest negative aspect. The quality of the backup video camera is lacking but still shows quite good. Dashcam is well packed. The video quality is amazing! The specification says to use a 16-32GB card, I use 128GB and it works fine. Easy to install and the interface is very easy for users. Great product! Updating this product worked as advertised, the camera locked the video when I had an accident a few days ago. I continue to get praise for the video quality of everyone in the company and now they want it. This camera saves my job! The highway patrol officer watched the video and that was all he needed. he asked me to email him to submit his report. The woman who hit me tried to blame the situation on me. He doesn’t know that I have a bad boy on my truck. Highly recommend this product. 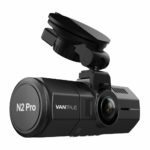 With the presence of several features embedded in this camera, it adds value to this dash cam, so that this product becomes one of the best options for 2019. From the experience presented by Toguard 7 users, it can be concluded that this dash cam is one of the excellent products that is a best seller.Nowadays vehicles will come with several advanced features aimed at enhancing your driving experience, and they include things like built-in reverse cameras and GPS.But if you have an old model without these practical features, you can always add it later.And one of the best places to start is by installing a dash cam mirror. And with our reviews above from some of the best rearview cameras and purchasing guides, you now have an idea of what to buy.